Simulation does not match up with what I'm seeing in game. For example, identification scrolls show up in preview but not in game. Same with chromatic orb recipe items. Only very few items do show up, all the rest is hidden, which is not what I chose and is not what the preview shows. I would love the option to fuse or copy-paste certain parts of one filter into another. Like right clicking one part, copy it and then insert it into another filter, expanding or overwriting that section. I recommend you check that again, because I'm preeeeetty sure the simulator is working correctly. If you still think there is a problem I'd ask you to send me a link to your filter (via online save) and I'll check it out. I think it was because of the fade out and apparently dropping scrolls/items to test out doesn't work the way I thought it would. Not sure where I can get rid of the fade out. So how do I update all these things (can't copy and paste them) when there are no instructions on this error message on how to update them? I didn't make these change, so why is it telling me to redo the changes? I never edited any of these segments on my previous filter. There is nothing on FilterBlade that says Shaper Items Tier 2A, Only Shaper Items Tier 2 Classes. Where is A and where is B? Hidden items inGame are actually hidden (except if you hold Alt). Hidden items in the filterBlade simulator are still shown, but faded out and with strikethrough, just to tell the user "this item was generated, but the filter is hiding it". If you disable the "Show hidden items" in the simulator, those item are actually hidden, just like inGame. 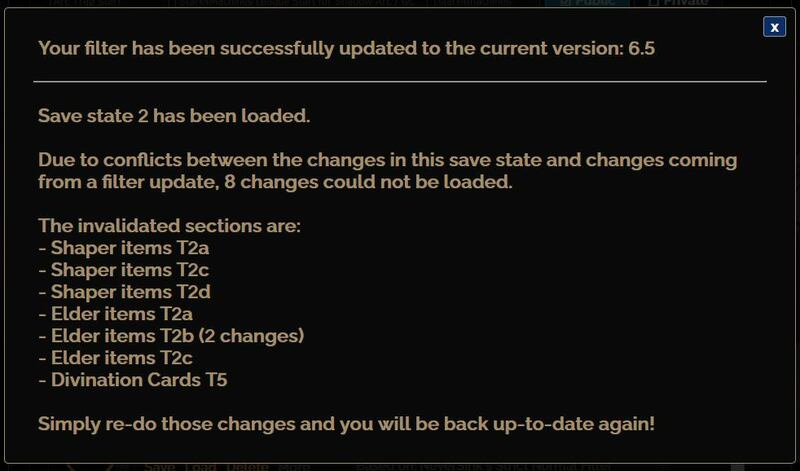 We're aware that those messages can be confusing, but basically it just means: You (or whoever made the saveState you're loading) made edits towards those rules of the filter, but FilterBlade cannot safely load them. In this case, this is because those Shaper/Elder rules were removed from the filter. And the Divination Cards tierlist have been reset for the 3.5 update, just to give you the updated tiering and new cards. Can you provide a bit more info on how to trigger this bug? And/or a link to an online save? Because FilterBlade usually just puts "untitled" into the filter when you didnt write anything into the input field. Else it would be a filter syntax error thats even more confusing. Maybe you just forgot to enter a sound name for a certain rule that you overlooked or mixed up? I'm pretty sure I didn't leave them blank, I spent an hour adding these custom sound names to the filter the first time this happened, and every subsequent time I've been trying I only did one at a time to see if I missed something. For me, if I take that save and find the error of the let's say for example. Tier 1 currency, and note that the error is in the download screen, and go back to that page and update the name to a real name "foo.mp3", and return to the download screen, it still shows up as throwing an error. Consequently if I return back to the tier 1 currency config, it now shows untitled.